Roundup® Tough Brush & Poison Ivy Control READY-TO-USE Spray 5L Poison Ivy & Brush Control Non-Selective Herbicide is a non-selective vegetation control herbicide which controls poison ivy and brush, as well as most annual and perennial grasses, including lawn grasses & broadleaf weeds. Brush & Poison ivy control; On patios, walkways and driveways; In flower beds & vegetable gardens; Around trees, shrubs & ornamentals; For edging along fences, driveways, foundations. In large areas for lawn replacement & garden plot preparation & brush control. Follow illustrations and instructions. Spray the weeds or grasses you want to eliminate until thoroughly covered. For best results ensure that Roundup(R) Ready-to-Use Tough Brush & Poison Ivy Control with Wand Applicator gets down to the roots. Avoid tillage or disturbing the treated area for 7-10 days. This will ensure that the entire plant, including the root, is eliminated. Avoid spray contact on desirable plants as any plant contacted may be killed. When spot treating around desirable plants, shield plants from drift with a piece of cardboard or plastic. If a desirable plant is accidentally sprayed, rinse off immediately with water. Do not apply to the point of run off. IMPORTANT: Do not spray plants or grasses you like - they may die too. Not recommended for spot weed control in lawns since Roundup® Ready-to-Use Tough Brush & Poison Ivy Control with Wand Applicator kills lawn grasses. Apply to annual weeds anytime after emergence. For perennial weeds apply after seed heads, flowers or berries appear. For best results, apply during warm, sunny weather (above 15°C) to accelerate systemic movement from foliage to roots. Apply when air is calm to prevent drift to desirable plants. Apply to annual weeds anytime after emergence. Double strength formula to control unwanted poison ivy and brush. Fast acting formula - results in 24 hours. The information on this site refers to Roundup® Weed & Grass Killer products and is for homeowner use. Always read and follow label directions. *Consumer Guarantee: If for any reason you are not satisfied after using this product, simply send us original proof of purchase, and we will refund the purchase price. Always read and follow label directions. 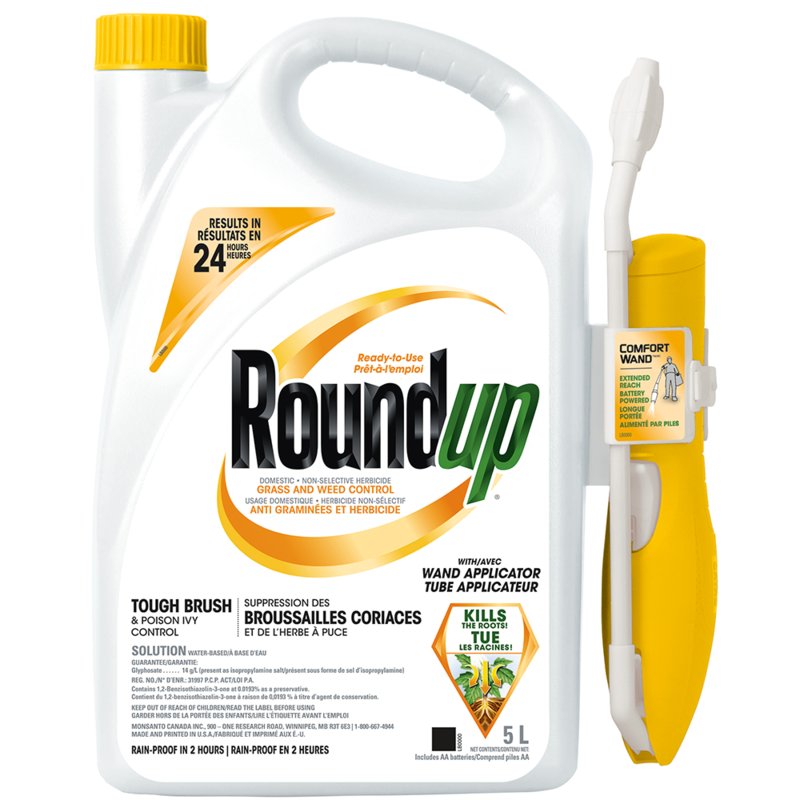 Roundup, Roundup & design, FastAct, Roundup Extended Control and X design, Roundup® Precision Gel™, Pump 'N Go, Sure Shot and Draw the Line are trademarks of Monsanto Technology LLC. © 2019 Monsanto Company, worldwide rights reserved.